Kenmore introduces the Elite White HE3 Model 9787. This Kenmore Elite HE3 model is a 7.0 cu. 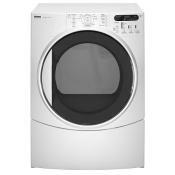 ft. gas dryer in white with a size dimension of 38 inches in height, 32-1/2 inches in depth, and 27 inches in width. The dryer has a weight of 147 lbs. and costs about $700. Here are the features as well as the summary of consumers' opinions regarding this super capacity gas dryer. EvenHeat technology - The EvenHeat technology protects the fabric of your clothes. The system ensures your clothes' gentle and fast drying. Wrinkle Guard - This system prevents the wrinkling of clothes, as it tumbles the clothes for 120 minutes without heat. The delicate fabric, on the other hand, is dried through air fluffing to prevent the fabric from shrinking. QuietPak 4 - With this feature, the machine dries clothes without noise. The sound insulation in the unit keeps noise and vibration to a minimum level. Flexible installation - The unit has 4-way venting, which gives consumers the installation options depending on the available space. Heated Dryer Rack - This feature ensures the fast drying of the fabric, drying three times faster than any dryer rack. One of the best things about this gas dryer is its large loading capacity. At 7.2 cu. ft., the dryer can dry large loads in single loading. The unit is also gentle on delicate materials. Instead of drying the delicate fabric through heat, this machine uses air to ensure gentle drying. Clothes loaded in this dryer also come out almost wrinkle-free. Another reason why this unit is popular is that it benefits consumers with its noise-free operation. Unlike any other dryers, this one dries very quietly. The unit is also a space-saver. It has optional pedestals that could help you manage the space on your laundry room. Aside from this, it is also stackable. This model is quite inexpensive compared to others. Wits its $700 sale price, this unit is relatively cheaper than the other units from Kenmore and other brands. If this super capacity gas dryer has a lot of good points, it also has some drawbacks. One of these is that it gives off excessive lint. At some point, the excess of lint will cause fire. The product's service policy is not customer-friendly as well. There are some complaints regarding this issue. Another drawback of this model is that it is only available in white color; stains and dirt are quite visible when cleaning is not done regularly. The style of the machine is not really that elegant. It actually lacks a touch of a modern and elegant home equipment. Comments for Kenmore Elite HE3 Model #9787 Super Capacity Gas Dryer 7.0 cu. ft.
We had dryer for about 5 yrs now. This dryer has had circuit board replaced along with other things, at least 4 times. Now the brains at sears has a set up where if your in shower and miss service call you have to re-schedule. I have truly had it with sears. I will not buy nothing from them.